CHIAVARI, Italy – In this week before Easter, religious festivities in Rome will be front and center on Italian television. The celebration officially start on Holy Thursday with the Mass of Chrism, (holy anointing oil). This mass includes the reading of the Passion, which chronicles Jesus’ capture, suffering and death. Later in the day, at the Mass of the Lord’s Supper, Pope Francis will wash the feet of 12 men, following the tradition of Jesus and his Apostles. Both masses mark Christ's founding of the priesthood at the Last Supper on the night before he died. 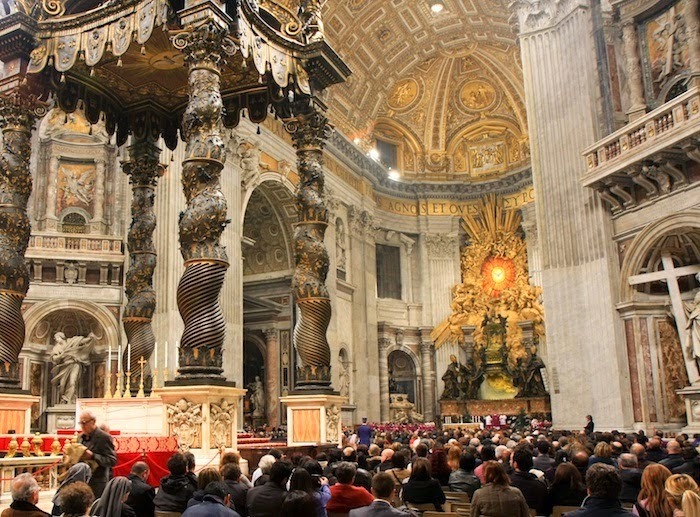 On Good Friday, the day of Christ’s crucifixion in 33AD, the Pope says mass in the Basilica of St. John Lateran (Basilica di San Giovanni in Laterano). St. John’s was built by the Roman Emperor Constantine in the 4th century. Constantine was the first Roman Emperor to convert to Christianity, and St. John’s is the cathedral of the Bishop of Rome. 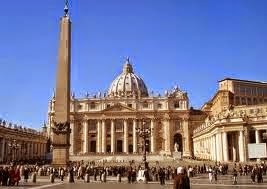 It is known as Omnium urbis et orbis Ecclessarium Mater et Caput – the Cathedral of Rome and of the World. 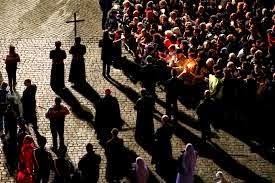 Friday evening the Pope leads a torch-lit procession from the Coliseum to Palatine Hill (Via Crucis Procession), and at pre-designated stops, the faithful recite the prayers for each of the Stations of the Cross. 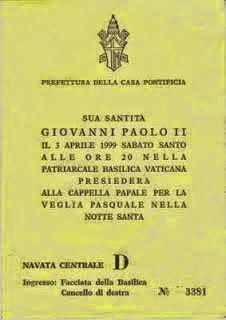 The Easter Vigil mass at the Vatican’s St. Peter’s Basilica will start at 9PM on Saturday night. No lights will be lit. The Basilica will be shrouded in darkness until Pope Francis enters. He will be carrying a long, white Paschal, a special Easter candle decorated with gold leaf. 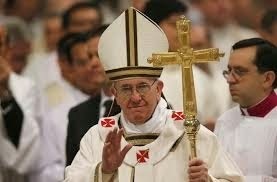 He will be dressed in a gold robe, called a chasuble, with a white and gold stole around his neck. On his head will be a precious gold and white mitre encrusted with jewels. The mitre style was adopted from the Romans who wore hats that were very similar, and the chasuble is a variation of the robes worn throughout the Roman Empire. The colors of the Pope’s chasuble and mitre are important as colors represent qualities such as virtue and holiness. The gold color of the Pope’s chasuble symbolizes what is precious and valuable. It also symbolizes majesty, joy and celebration, and because of its brightness, metallic gold, like that found on the Pope’s miter, symbolizes the presence of God. Under the chasuble Pope Frances will wear a white robe, but all you will see of it V is a part of the collar around his neck and the edges of the cuffs under his sleeves. The color white has long symbolized purity, holiness and virtue, as well as respect and reverence. It is a color used by the Church for all high Holy Days and festivals. Easter Sunday is joyful. The Vatican altar is filled with flowers in to celebrate the Resurrection of Jesus and his Ascension into Heaven. The Pope shares this special day with the thousands of faithful who gather in St. Peter’s Square to see him. He stands before the crowd and delivers his message of peace for the Urbi et Orbi (the city and the world). After the Urbi et Orbi message, which is broadcast throughout the world, the Pope blesses the crowd. Some tour operators have been known to charge large amounts of money for a Papal audience, but the truth is the Vatican does not charge for the Papal audiences. They are free. It’s easy to organize your own visit, you just have to do it well in advance, as tickets are limited.